If you had trouble completing research, satiating your desperate need for an in-depth summary of the most recent episode of “Parks and Recreation,” or finding adorable captioned pictures of kittens yesterday, you can blame online opposition to two pieces of legislation currently being debated in Congress: the Stop Online Piracy Act and the PROTECT IP Act. Both bills aim to reduce online piracy, but how they propose to do so is drawing dramatic protests from online freedom advocates and resulted in “black outs” from an estimated 7,000 websites yesterday, including major names such as Wikipedia, Reddit, and I Can Has Cheezburger. Politico’s overview is a good starting point for readers completely unfamiliar with the situation. The Stop Online Piracy Act, or SOPA, in the Senate and the PROTECT IP Act, or PIPA, in the House both aim to reduce piracy by cracking down on “rogue sites” that link to and profit from pirating copyrighted material. Opposition to the bill is largely based not on opposition to protecting copyrights, but due to concerns about the potential for abuse in the vagueness of the legislative language. For instance, as written, SOPA would empower the attorney general to blacklist sites through Internet service providers, or ISPs, search engines, ad networks, and payment networks without a court hearing or trial and allow companies to sue service providers for unknowingly hosting copyrighted materials. This could leave room for collective reprisals against entire online networks such as Twitter or Tumblr for the copyright infringements of a single user, arguably resulting in the mass censorship of entire online communities. From an economic standpoint, it could also require ISPs to monitor and censor network use to ensure users are not infringing, placing heavier cost burdens on Internet startups that rely on user-generated content. Many Internet users and technology companies argue this would slow innovation in the increasingly interconnected and networked 21st century information economy. Supporters of the legislation say the purported dangers of the legislation are overstated and that the legislation is aimed to take down only rogue sites with no legitimate business purpose. They even responded to earlier criticism in December with a manager’s amendment aimed at reducing the impact on domestic websites, although it appears that while the legislation may target foreign sites, the legal liability might very well apply to domestic sites and companies as well. The debate has been escalating for months online and in Washington, where both bills started with wide bipartisan support. As online protest has grown, that picture has somewhat changed, with the Obama administration commenting on issue. The White House’s statement walked a fine line of moderation, saying the “important task of protecting intellectual property online must not threaten an open and innovative internet,” which has been interpreted as an anti-SOPA position, although by not referencing the specific pieces of legislation, the statement indicates the fight clearly isn’t over yet. 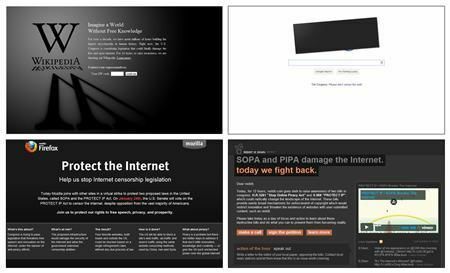 At the forefront of the blackout was online encyclopedia Wikipedia, whose English homepage was replaced for 24 hours with a message stating SOPA and PIPA “could fatally damage the free and open Internet,” and offering more information and an opportunity for U.S. visitors to contact their congressional representation. Similarly, popular social link-sharing site Reddit.com went down for 12 hours and provided a technical run down of their opposition. Search giant Google obscured their logo with a black rectangle and featured a call to action on their homepage, leading the charge of numerous sites raising the online equivalent of protest flags. Additionally, online freedom and privacy advocates including the Internet Society, Electronic Frontier Foundation, and the Center for Democracy and Technology have all provided supporting documentation outlining their objections to the legislation. A list of confirmed participants in the online blackout can be found here. Despite Sen. Leahy’s comments, some original co-sponsors of both pieces of legislation have pulled support since the announcement of yesterday’s online protests and those still supporting the legislation are working to remove some of the most controversial provisions. So where will this legislation go? No one honestly seems to know. Despite early hopes that the bill would sail uncontested into the law books, the online backlash against SOPA and PIPA in coordination with hesitation from the Obama administration and some members of the Republican leadership appear to have slowed the charge. No one expects, or wants, the MPAA or Recording Industry Association of America to stop working to protect intellectual property rights, but the flood of co-sponsors abandoning ship due to activism and the associated increased media scrutiny may signal a change in how those advocates approach major Internet regulations in the future—or at least force them not to underestimate the power of online communities to make their side of the story known. But at least for now, the future of these bills, and the debate between online freedom and protecting intellectual property rights, are up in the air. Andrea Peterson is Assistant Editor for Online Outreach and Analytics at American Progress. “[M]uch of what has been claimed about the Senate’s PROTECT IP Act is flatly wrong and seems intended more to stoke fear and concern than to shed light or foster workable solutions. The PROTECT IP Act will not affect Wikipedia, will not affect Reddit, and will not affect any website that has any legitimate use. A foreign rogue website is clearly defined as one that has no real purpose other than infringement. Theft and fraud on this scale undermines consumer trust in online transactions." Despite Sen. Leahy’s comments, some original co-sponsors of both pieces of legislation have pulled support since the announcement of yesterday’s online protests and those still supporting the legislation are working to remove some of the most controversial provisions. The future So where will this legislation go? No one honestly seems to know. Despite early hopes that the bill would sail uncontested into the law books, the online backlash against SOPA and PIPA in coordination with hesitation from the Obama administration and some members of the Republican leadership appear to have slowed the charge. No one expects, or wants, the MPAA or Recording Industry Association of America to stop working to protect intellectual property rights, but the flood of co-sponsors abandoning ship due to activism and the associated increased media scrutiny may signal a change in how those advocates approach major Internet regulations in the future—or at least force them not to underestimate the power of online communities to make their side of the story known. But at least for now, the future of these bills, and the debate between online freedom and protecting intellectual property rights, are up in the air. Andrea Peterson is Assistant Editor for Online Outreach and Analytics at American Progress.